Review published in IJPE, Vol. 8, No.2, March 2012, p.220. The present book is an updated second edition, the first one having been published earlier in 2006. This is primarily on account of the fact that ad hoc and sensor networks are a fast growing field with intensive and extensive research being performed, aiming to provide higher quality service than ever to various applications such as medical care, environmental monitoring, construction structural monitoring, railway monitoring, smart energy and home, and military applications. 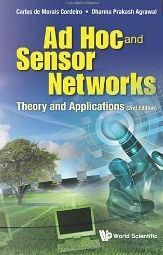 Co-authored by Cordeiro and Agrawal who have extensive academic, research, and industrial experience, this second edition of the textbook on ad hoc and sensor networks provides a comprehensive coverage of the subject matter, from various design considerations through performance issues to application and implementation requirements. Due to the particular nature of ad hoc and sensor networks where there exist significant interdependencies and interactions among different layers of the network protocol stack, the presentation of this book adopts a new explanatory cross-layer model that can help readers better understand all aspects of these networks including routing protocols, data delivery models, scalability, security, quality of service, standards, topology, and applications. Each chapter of the book is concluded with some indications to future research initiatives and challenges in a particular subject area, which allows a reader to dig further into the subject and develop new capabilities in the field. Each chapter is also provided with a list of relevant references as well as a set of homework questions and simulation projects that can facilitate a deeper and better understanding of the subject. Besides being useful for students in the classroom, this textbook can also serve as a good reference book for researchers and engineers working in both academia and industry in the field of ad hoc and sensor networks. Review published in the International Journal of Performability Engineering, Vol. 8, No. 2, March 2012, p. 220.